Folks are sensitive about breaking their fast in the morning. On the continent they do it with Viennoiserie (pastries) and coffee served in a bowl. In Italy they do it standing up at the counter in short, dark shots, in America they do it... And the English, when they do it properly, do it with aplomb, with A Full English. And The Wolseley, with its reputation for serving breakfast par excellence, must cater to all nationalities and tastes. If you've not been before and you have a table booked then starve yourself of meat the night before and rally your stomach for The Full English. It takes stamina to eat this much of a pig at this hour, but there's nothing that can compare to the scent of bacon in the morning, except for the scent of bacon, sausage and black pudding. If you know you're not fit for it there are plenty of other, less porky, options. Beyond the croissants there are Danishes, beyond the toasted baguettes there's crumpets, beyond the granola there's Birchermüesli, beyond the omelettes and Eggs Benedict, The Wolseley's signature dish, there are crepes and Kedgeree and beyond all that there's French toast and pancakes. There's probably no breakfast menu in town that's more eager to please. The only thing that folks are more sensitive about than breakfast in the morning is their first proper beverage of the day. 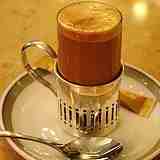 If it's going to be a coffee it has to be perfect: which is why The Wolseley serves 13 different kinds. If tea's your tipple then you're allowed to be just as picky: they have nine different teas. The other thing The Wolseley is famous for is the service. Their maître d' knows whose birthday it is, who's lactose intolerant and who wants what newspaper, and the staff, in their black and grey, provide the kinds of service you could have once expected from the perfect butler – only they have to provide it for a room full of strangers. First thing in the morning. And to top it off it's a beautiful room. High ceilings and lots of light are topped off with perfect silverware and just the right ambience for each phase of the morning's service. This needs also to be taken into account when booking: the first arrivals are the in-and-out businessmen with their suits and cereal and coffee, then it's the people talking deals over breakfast: publishers, journalists, people having job interviews, then it's the PR and media folks whose offices open a little later and then it's the ladies-that-breakfast and the visitors to town and celebrities trying to be seen the morning after the night before.